Apple's first quarter earnings are in. 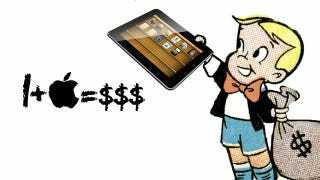 According to Bloomberg News, Apple made $13.1 billion in profit on $54.1 billion in revenue. It sold an absurd 47.8 million iPhones and 22.9 million iPads—both records. Somehow, this is a disappointment. Apple has been fighting off rumors of lagging interest in its products—iPhone and iPad specifically—for weeks now. The $54.1 billion missed the $54.88 market estimate, and the company's stock continued to fall after hitting a record back in September. But these numbers really highlight the level of scrutiny (and, yes, idiotic hype) Apple faces, setting records in sales and revenue and still disappointing everyone. Especially since this quarter was made up of 13 weeks, while last year's Q1 was 14 weeks. For reference, last year over the same period, Apple made a profit of $13.06 billion on $46.33 billion in revenue. It sold 37 million iPhones and 15 million iPads, both records at the time, and both obliterated by today's results. (Though this year's iPad figure likely includes the new iPad Mini; we'll update as that's made clear.) So profit is down, slightly, but this isn't a case of Apple taking a dive so much as leveling off. It sold 833,333 iOS devices—iPhones, iPads, and iPods—PER DAY. Its on-hand cash (which you should note does not mean "immediately spendable) grew to $137 billion. That's not to say there's nothing disappointing to come out of the earnings. Apple missed its estimates on Mac sales, 4.1 million, short of the 5.1 million estimate. But it's been a long time since Macs have been Apple's cash cow. And maybe more importantly than individual sales, Apple made gains in important markets like China, where iPhone sales more than doubled from last year. Stock prices are dependent on maintaining momentum and Apple's crazy growth in sales and profit set expectations stupidly high. Just don't think this means Apple's going anywhere any time soon.